Well I've hope you've seen it! It's hard for sequels to get much better than this, and we still get one more movie next year to boot. You are going to need a good memory of the flick though for this week's quiz- a mixed bag of easy and ridiculously tough Two Towers trivia. 1 - 9) Group 'em Up! Unlike Fellowship of the Ring, The Two Towers sees three groups of characters split of separate stories. Your job here is to identify the three groups and where they ended up in their respective final battles towards the end of the movie. As an example, if this question were instead showing the characters from Return of the Jedi, then Han, Leia and Chewie would be on 'Endor', Luke, Vader, and the Emperor would be on 'Death Star', and Lando, Wedge, and Admiral Ackbar would be in 'Space battle'. Got it? Good! Get to it! 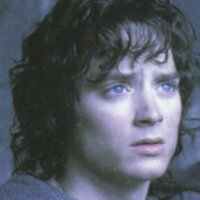 10) Who was Frodo dreaming about, at the start of the movie? 13) What did Gollum say to Frodo after he saved him from drowning in the Death Swamp? 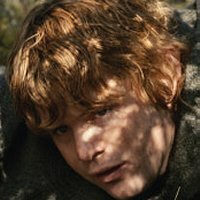 11) What snack do Frodo and Sam eat when they are heading to Mordor at the start of the movie? 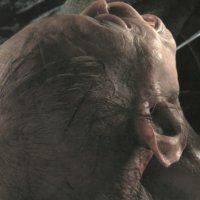 14) Which animal DIDN'T we see Gollum eat? 12) How many tusks did the Oliphants have that Frodo saw? 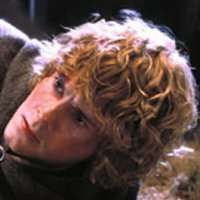 15) What item did Aragorn find that Pippin had dropped when he was tracking the kidnapped Hobbits at the start of the movie? 16 - 18) Saddle up! 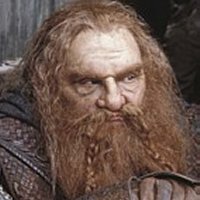 Gimli, Legolas, and Aragorn received two horses from the Riders of Rohan and rode two to one horse and one on the other. Put the riders on their correct horses by assigning the color of steed that each character rode. Beware, there is one extra color- remember there were only two horses. 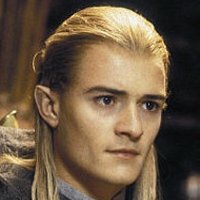 19) What did Aragorn introduce Legolas as, to the Riders of Rohan? "Legolas of the Northern Realm"
"Legolas of the Woodland Realm"
21) What marking was on the banners the Orc army carried, on their march to Helm's Deep? 20) Who did we see let out a hearty belch after drinking some ale? 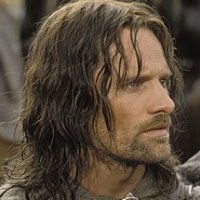 22 - 23) What were the numbers Legolas said to Aragorn when he told him that the Battle of Helm's Deep was a lost cause, before the other Elves arrived? Match the quote to the name of the character who is speaking the line. As always, spies of the Enemy have put extra names in the list so choose carefully! 27) How many 'lives of men' did Gandalf say he had lived? 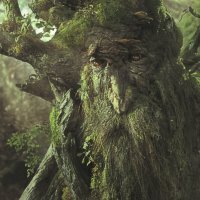 30) What kind of tree-Ent DIDN'T Treebeard mention by name, when they started showing up at the Ent meeting? 28) Where did Gandalf first stab the Balrog when we see the two falling down through the depths of Moria? 31) What were the main colors of the three banners directly behind Theoden's throne, in Edoras? 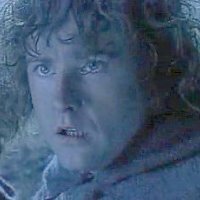 29) What did Treebeard think that Merry and Pippin were when he first met the two in Fangorn forest? 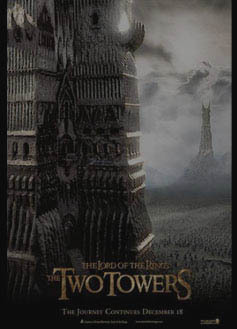 32) What's the name of the sequel to The Two Towers due in theaters Christmas 2003?